Summary: In this, the long-awaited conclusion to the saga of Abbey and Caspian, readers finally learn the truth about Kristen's death, the dark destiny that links Abbey to Caspian and the hard choices that Abbey must make if she is to accept Caspian's love and their unexpected fate. Review: Where do I start describing how AMAZING this novel is. I truly am speechless. Can this series get any better!? Any more emotional, Heart breaking, tearful and romantic? Yes! 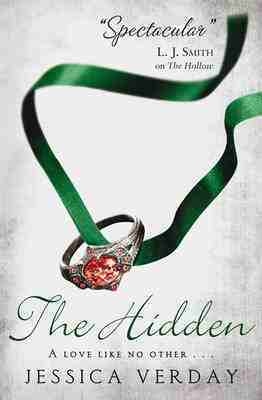 The last book in the The Hollow series The Hidden is a perfect ending for an amazing series. Caspian and Abby are back and more in love that ever. Things are changing and looking worse for wear and through out the novel I was on the edge of my seat praying that everything would be okay. This novel was defiantly the best out of the whole three. Just because things we waited for through out the series all seemed to come into place. Jessica has written such a captivating exciting story. This book has got to be the most romantic book I have read in a long time. Each chapter, each page and each line had me crying, sighing and smiling. I've never had a book touch me in such a way that had me thinking about it days after. Again the scenes between Caspian and Abby are amazing! Even more beautiful than ever. Some really touching moments and if you loved their scenes in the first two books then you will LOVE these scenes. I promise you. There is a lot of surprises in this novel. And its really hard not to give spoilers because Its one of those novels you just want to tell someone about straight away and tell them everything. The amount of times it left my jaw hanging open and tears streaming down my face was unbelievable.